Flagship property shows off fresh style and sleek technology enhancements for today’s modern traveler and convention attendees. 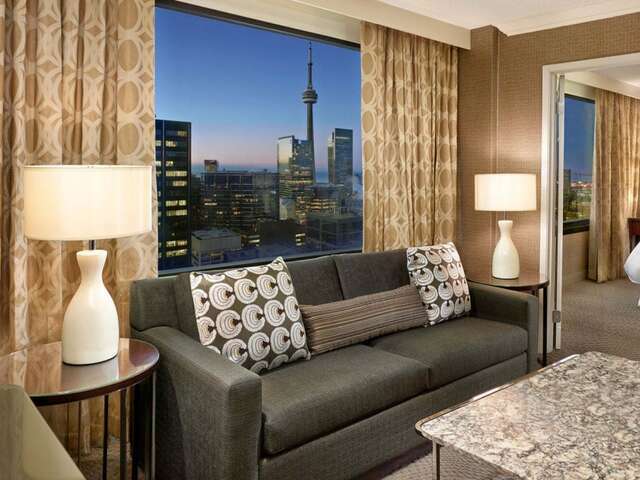 TORONTO - Sheraton Hotels & Resorts, part of Starwood Hotels & Resorts Worldwide, Inc. announced the completion of an extensive $120 million renovation of a flagship property, Sheraton Centre Toronto Hotel, located in the heart of downtown Toronto. The two year refurbishment project includes a full overhaul of all 1,372 guest rooms and suites, as well as the completion of function space expansion and meeting room restorations. All guest rooms and suites at Sheraton Centre Toronto feature completely new carpeting, vinyl, drapery, case goods, desks, chairs and LG® LED 55” flat screen televisions. Bedside tables come equipped with electrical outlets to charge devices and each room features bedside docking stations. Fully renovated bathrooms, many of which feature walk-in showers, include low-flow toilets, shower heads and aerated faucets. Additionally, the 300 Club Level guest rooms offer new refrigerators with higher efficiencies for guest use and convenience. Guests can expect a premium sleep experience with brand new custom-designed beds from Simmons®, offering a plush-top mattress and solid foundation with all white bedding and linens. The hotel now offers more than 130,000 sq. ft. of premium meeting and event space with the addition of the Willow and Provincial ballrooms. The Lower Concourse Convention floor, which includes the Grand Ballroom, Sheraton Hall and the Osgoode Ballroom, features a new state of the art Lutron lighting control system, allowing clients the flexibility to control and adjust lighting in the rooms via a loaned iPad®. More than 110 new structural rigging points throughout the Grand Ballroom allow 1,000lbs. per rigging point, giving planners and design companies tremendous flexibility when staging special events. Upgraded acoustic walls, new carpet, vinyl and paint complete the convention floor refurbishment and upgrade. The eight smaller meeting rooms on the fourth floor of the Queen Tower were also redone, and all carpeting, vinyl, fabrics and upholstery in both the meeting space and guest rooms meet Starwood’s low volatile organic compounds (VOCs) requirement. As part of the renovation, the hotel now features intuitive technology with its revamped wireless Internet infrastructure and installation of new access points, resulting in the fastest Internet and largest bandwidth among Greater Toronto area hotels.